The Hwaen Hnaa Loha Luang Por Jong, is One of the extremely rare amulets of the Great Luang Por Jong 2499 BE (1956) - The Hwaen Hnaa Loha Gan Pai Guru Monk Ring Of Protection Amulet from the Great Master of the Indo-China Wartime Era, Luang Por Jong, of Wat Na Tang Nork. 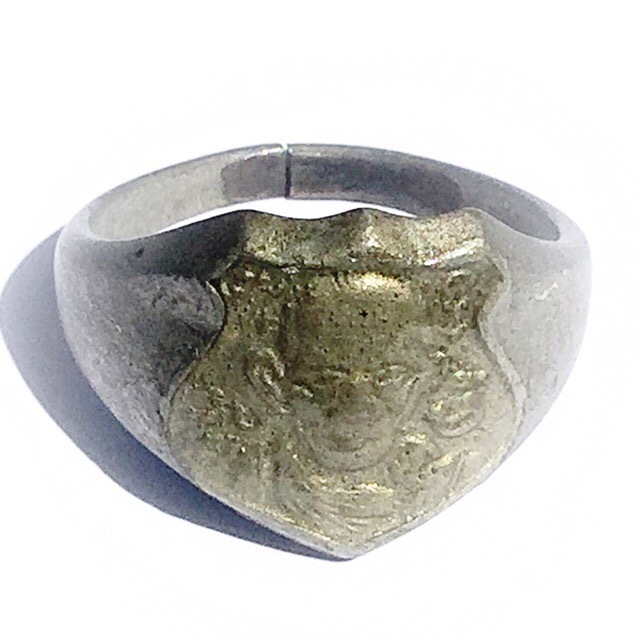 Luang Por Jong was an Olden Days Ayuttaya Master Monk, whose amulets protected the Thai Military during the Indo-China and Vietnam Wars - This ring is a very rare item. Ring has a split in it for size adjustment, and rests naturally at 2 Cm inner diameter as seen in picture. Luang Por Jong made various styles of rings in his Era, some of them in Albaca with Silver, and others with Trairongs Tri-Colored Lacquers. All of them are rare items to find. 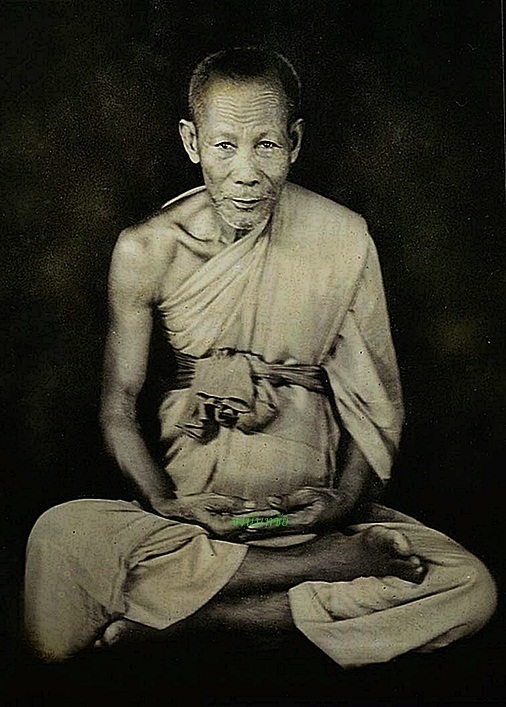 Known for his Kong Grapan Chadtri Klaew Klaad protective amulets which were handed out to protect Thai soldiers during the Indochina Wars, his Ring Amulets, Pra Somdej and other Sacred Powder Votive Tablets, and Powerful Takrut, are as famous, as they are rare to find. The Hwaen Hnaa Loha Gan Pai, although extreme rarity, is also precisely fo its rarity, less well known by the general public, because few people ever get to see one. For those collectors and devotees of Luang Por Jong however, the ring is one of the most highly sought after and prized acquisitions. Luang Por Jong of Wat Na Tang Nork was one of the great Guru Masters of the Ayuttaya Province, in line with the Great Luang Por Parn of Wat Bang Nom Kho, and is one of the Great Masters who assisted the Thai Military with powerful Kong Grapan Chadtri and Klaew Klaad amulets during the Indochina Wars. His World Famous Yant Pla Tapian Ngern Tong - Maha Pokasap Lap Kaa Khaay Gold-Silver Fish amulets, are also renowned worldwide, for their ability to instigate good commerce and prolific sales quotas with sales persons. Luang Por Jong of Wat Na Tang Nork was one of the great Guru Masters of the Ayuttaya Province, in line with the Great Luang Por Parn of Wat Bang Nom Kho, and is one of the Great Masters who assisted the Thai Military in Wartimes, with powerful Kong Grapan Chadtri and Klaew Klaad amulets.